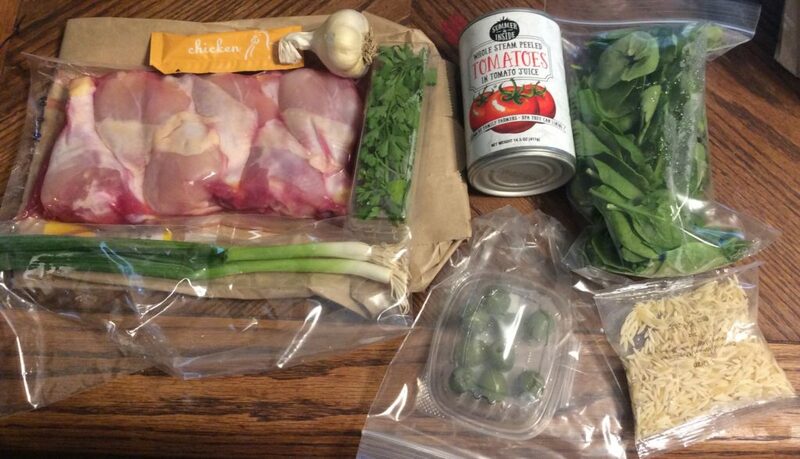 Martha & Marley Spoon is one of four mid-priced meal kit companies out there (the others are Hello Fresh, Blue Apron and Home Chef) and so far, the one I’ve been least impressed with. “Martha” refers to Martha Stewart, with whom Marley Spoon struck a partnership in 2016. Supposedly she has some influence on their offerings. I only got two meal kits, but both were somewhat disappointing. Still, two is a small sample and I may try more if I get any “come back” discounts on the mail. Martha & Marley Spoon offers plans for 2 or 4 people, and you can choose among 2, 3 or 4 meal kits a week. Kits cost between $8.20 and $12 per serving, depending on how much you order. The typical 3-meal kits with 2-servings each plan costs $61.50 a week, or $21/kit – $10.50/serving. Shipping is free in all plans. Marley Spoon offers 20 recipes a week, including 6 vegetarian ones. Vegans, however, are out of luck but there are at least 3 gluten-free options every week. The food seems to be modern American, with some ethnic accents. They seem to specialize in relatively safe recipes with broad appeal, including kid friendly offerings. Still, most of the recipes did not look particularly interesting or exciting to me. While recipes are relatively quick and easy to make, they call for some kitchen equipment that not everyone has at home, in my case, kitchen sears. Problematically, they don’t provide alternatives to that equipment. The ingredients tend to be rather simple and not particularly exotic, and some are inadequate for the recipes. For example, the canned tomatoes I got were whole and asked me to dice them, when they could have just as easily provided diced tomatoes. Both of my dishes included baby spinach, but in both cases all the spinach did is provide an unpleasant bitter flavor to the dish. Most of the food was fresh, but I did receive a bruised red pepper – still, it remained fairly firm until the end of the week, when I cooked it. My biggest beef is that the kits did not include all the ingredients necessary to make the meal. None of the meal kits include oil, salt or pepper, and Hello Fresh irked me by not including butter, but Martha & Marley Spoon went a step further to not include balsamic vinegar – in a dish for which it was essential. To me this is a big fail. My final complaint about Martha & Marley Spoon is that the portions were smaller than I wished. 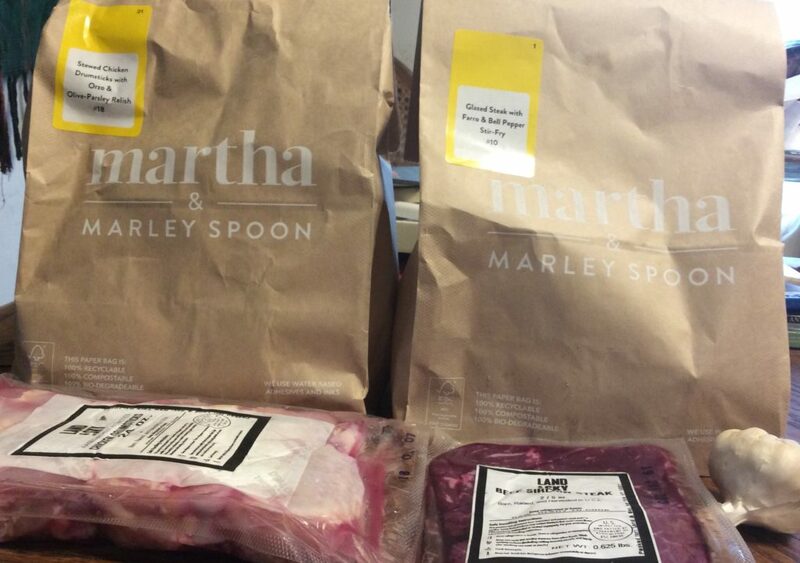 Martha & Marley Spoon is a bit better than its competitors as far as packaging goes. While the freezer packs need to be thrown in the garbage, the lining of the box is recyclable – unfortunately, there was no mention of this on either the lining or the literature that came with the box, I had to look it up on their website. Each kit arrives in a separate paper bag, which I prefer to plastic. I usually put the trimmings from the vegetables in these bags for curbside composting. The meats, as with other kits, were between two freezer packs and they arrived quite cold. A decent dish, though it left me hungry. The glaze was a winner, though. I paid only $18 for this box ($9 per kit or $4.50 a serving), using a promo I found online, and for that price the meals were a steal. At more than twice the price, I’d be pretty disappointed. This was my second Marley Spoon’s dish and, most likely, my last one. It was perfectly fine as a dish, and I thought the presentation was quite attractive, but it wasn’t special enough to justify the issues I had with it. First, the steak. It wasn’t particularly great quality – it was sirloin, after all -, and the two steaks were of significantly different thickness, which means that cooking them both together resulted in one more done than the other. While the tamari sauce (recipe below) added a very good flavor, the steaks were not particularly tender. 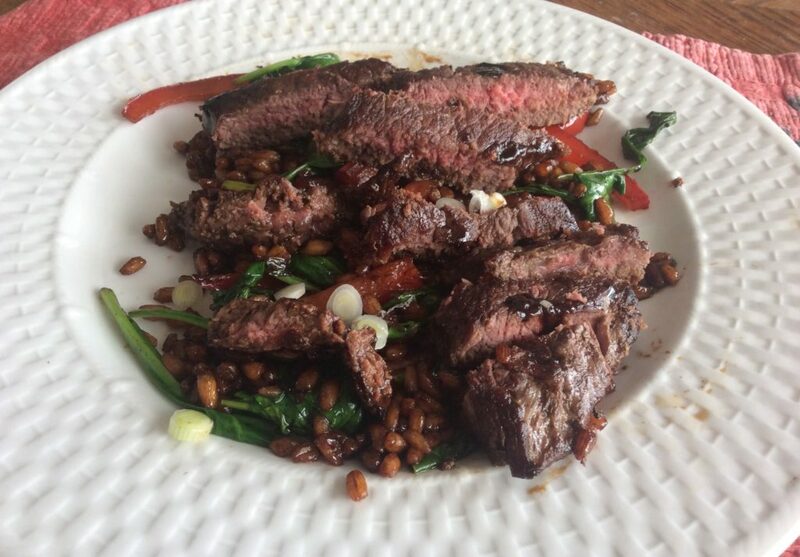 The farro/red pepper stir-fry was good – or would have been, had I not added the spinach. Once again, it provided an unappetizing bitter taste to the dish. The portion was also on the small side – I was left hungry after eating it. Even more vexing was the fact that the kit didn’t include all the ingredients I needed to make the meal. It asked that I provide my own balsamic vinegar. Fortunately, I had some – but the whole dish would have been a fail if I didn’t. To be fair, Marley Spoon did mention in the instructions online that dark balsamic vinegar was needed, but I shouldn’t have to look carefully at every recipe to see what ingredients I have to provide. They really should send everything you need other than oil, salt and pepper (other kits do). In all, it was a nice meal but frustrating. In a small bowl, mix all ingredients together until the sugar dissolves. Use to glaze meat or as a sauce. I have been meaning to try Martha & Marley Spoon for a while, but I struggled to find, among their offerings, dishes that I really wanted to try. I suspect that part of the problem is the photography they use on their site makes the dishes look wash out and not particularly exciting . We eat with our eyes, after all. But their offerings seem mostly pedestrian. 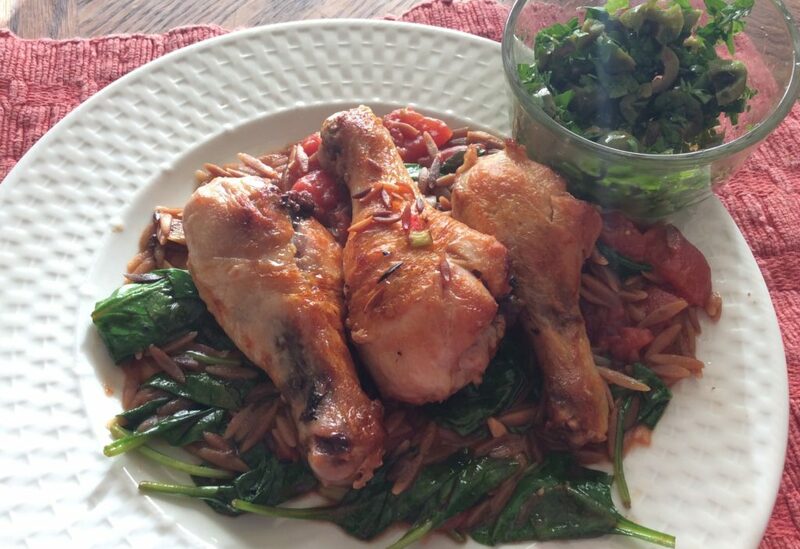 In any case, I chose this kit for Stewed Chicken Drumsticks with Orzo & Olive-Parsley Relish because it was something I thought my daughter would eat and because I was intrigued by the idea of making stew in less than an hour. I was disappointed by the results. The dish itself was relatively easy to make, though I was disappointed than rather than sending a can of diced tomatoes, they sent a can of whole ones and then asked me to cut them with kitchen shears – which I don’t actually own. I transferred them to a bowl and cut them with a knife, but that should not have been a required step. The main issue, however, was the results of the dish. The chicken, having been cooked at quite high temperatures, was not as tender as it should have been – and given that it was stewed for a relatively short amount of time, the flavors of the sauce had not been absorbed beyond the surface. 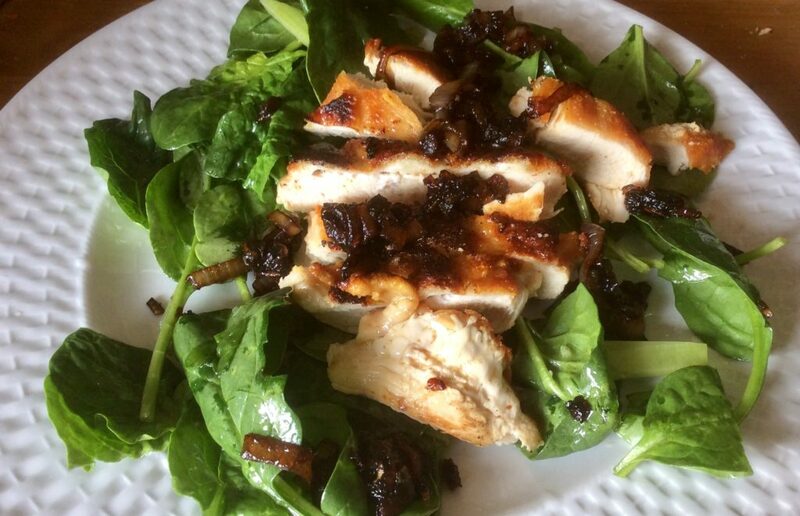 The sauce itself was unbalanced – a bit too bitter from the spinach – and lacked seasoning. Some more garlic and oregano would have done wonders. The relish added acidity, but I’m not sure the dish needed it. In all, it was an edible dish, but not at all exciting and I wouldn’t order it again. While the ingredients looked fresh when the kit arrived in Monday, by Wednesday night – when I cooked it – the spinach and the parsley were both losing its crispiness, even though I stored them in the fridge. I paid $9 for this kit ($4.50 pp) using a promo code – the regular price is about $21. 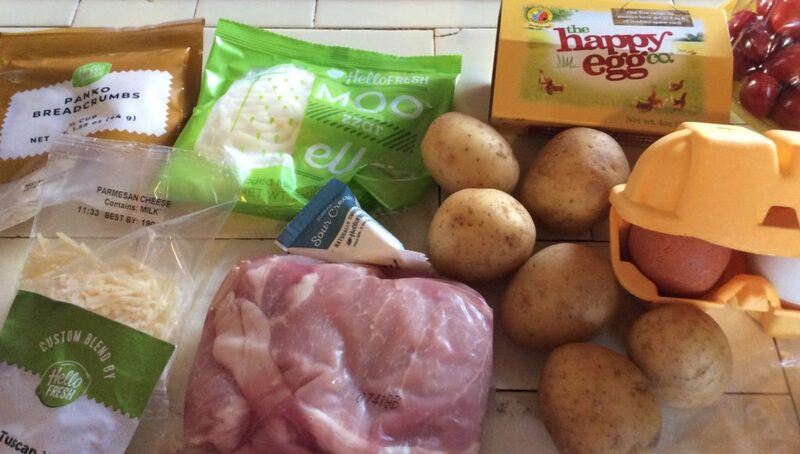 Blue Apron offers plans for two and four servings. 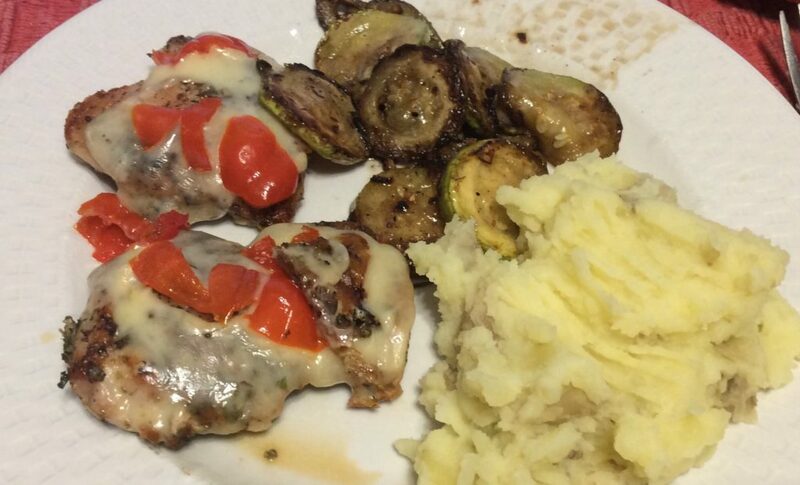 You can order either two or three meal 2-serving meal kits per week. Two will cost you $48 a week ($24 per kit, $12 pp) and three will cost $60 a week ($20 per kit, $10 pp). The 4-serving kits cost $72 for 2 kits ($9 pp), $96 for 3 ($8 pp) or $120 for 4 ($7.50 pp). In addition to regular plans they have a Weight Watchers “freestyle” plan and a vegetarian plan, both only available for 2 servings, and costing the same as the regular plan. Blue Apron offers 8 recipes a week, including 3 vegetarian ones – some of which can be turned into vegan. 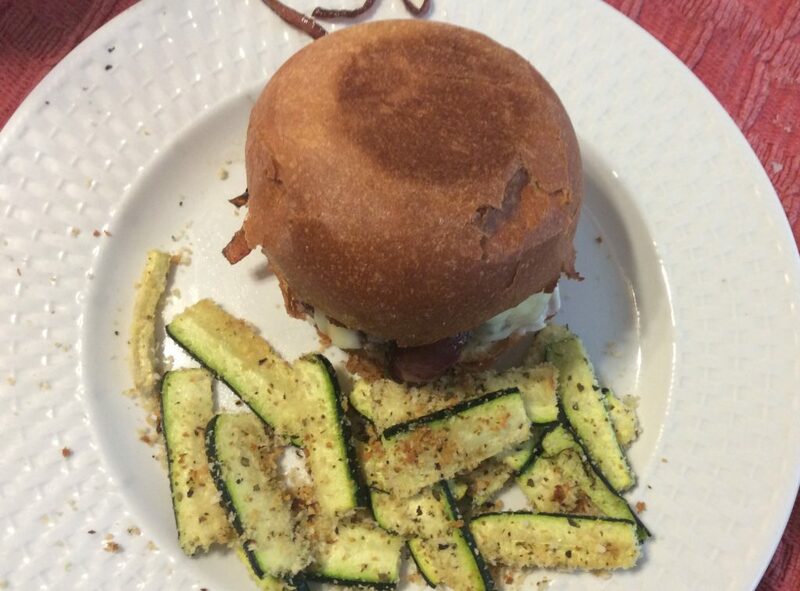 The recipes are mostly modern American food, which incorporates elements from other cuisines. I liked that they included ingredients that are not necessarily in my pantry – and that they didn’t skimp in the quality. I got ghee, rather than having to use my own butter, for instance, and creme fraiche instead of sour cream. 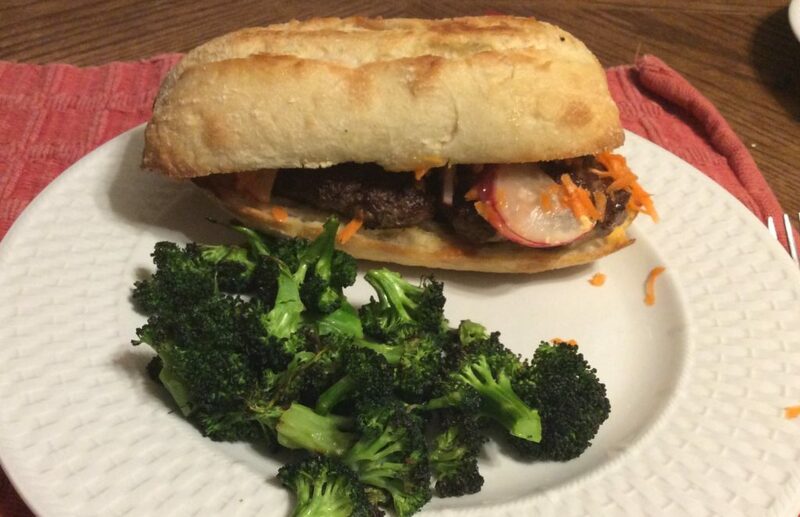 Blue Apron doesn’t seem to offer steak, so perhaps that’s how they save money. The ingredients were high quality and they came and stayed fresh (except for some wobbly carrots). The recipes were easy to put together. 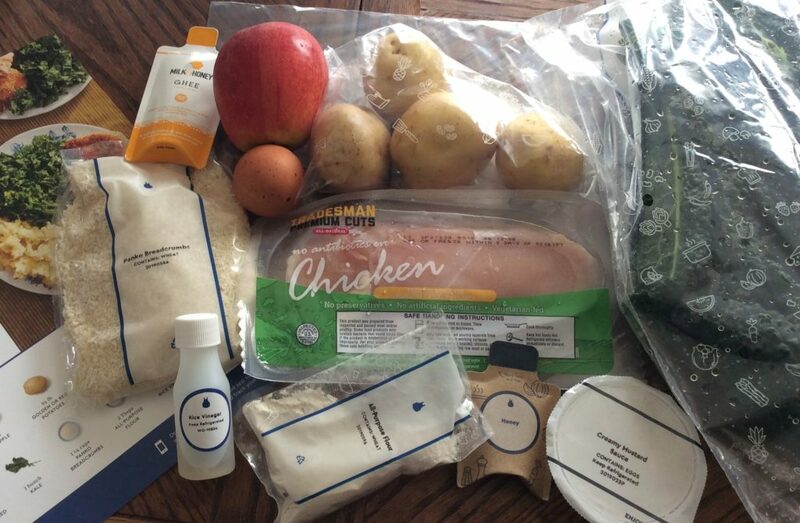 Like other meal kits, Blue Apron comes in a recyclable cardboard box. The ingredients were individually wrapped, but otherwise tossed together inside the box. 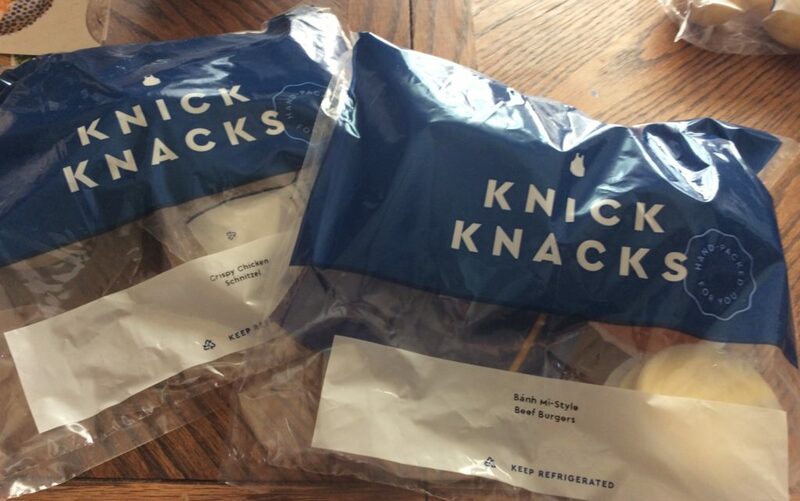 There were small bags with “knick knacks” for each recipe, however. Still, I prefer to have all the ingredients for each recipe in their own bag, so I can easily take them out of refrigerator rather than having to search for them. I was happy that I was able to drain the freezer packs – once defrosted – in the sink rather than have to throw them in the garbage. They were a thick gel even when defrosted, but it thinned with hot water. The lining of the box, however, wasn’t recyclable or compostable. I loved the curry spiced beef and the bread buns. 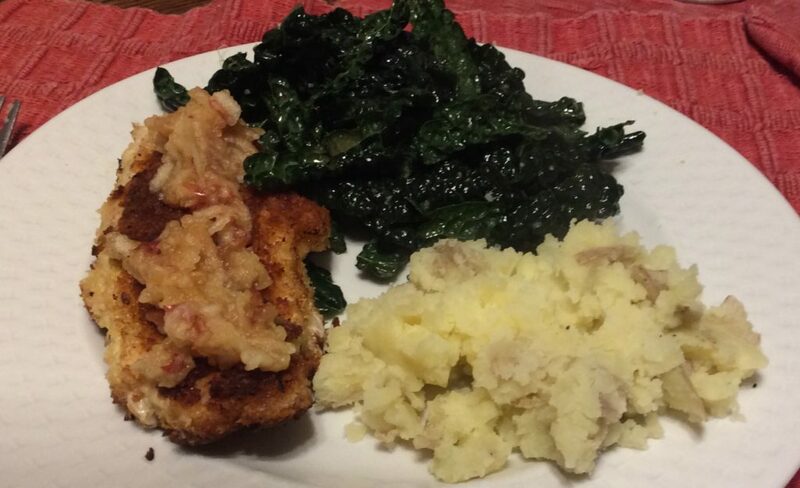 Liked the schnitzel, actually loved the kale. Really. All in all, I had fun cooking these meals and the results were perfectly fine. Blue Apron is priced the same as HelloFresh and HomeChef, and I feel it offers a superior experience to the other two. 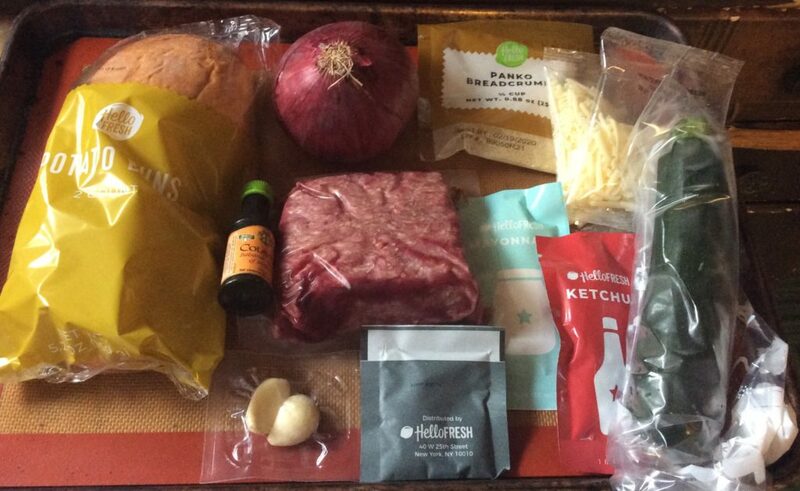 Cancelling was easy – but that has been true of all the meal kits I’ve ordered. Green Chef is a premium priced meal kit company, purportedly specializing in sending nutritious meals with a focus on organic ingredients. Their hook is that they offer plans for people in special diets – alas, they only offer five meal choices under each plan and you cannot pick kits from different plans. They also offer an “omnivore” plan, still with only five choices. This is the plan that I tried for a week – and in all, I didn’t think the premium price was justified given the kit ingredients. However, for people in special dies who are not well served by other companies, this may be a good choice. Green Chef offers two different plans. The 2-person plan provides 3 meal kits for 2. Subscribers choose one of seven diet categories: keto, paleo, gluten-free, vegetarian, pescatarian, vegan and omnivore, each offering five meal kit choices. Most plans are $79/week, including shipping, but the keto and paleo plans are $85. That means that kits cost between a little over $26/28 each and the per-serving price is just above $13/14. There is an extra discount if you order two or three vegetarian boxes per week – but not for the other plans. 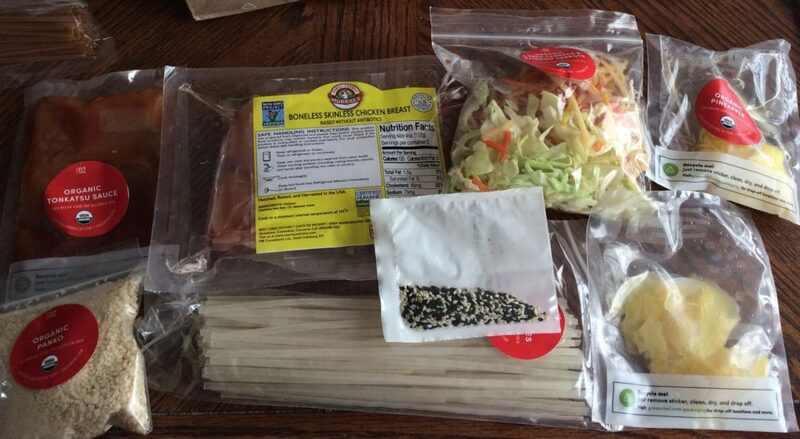 The four person plan provides 2 meal kits for 4 people per week. There is both an omnivore and carnivore plan, and while you can chose or the other, each plan has set meals. The cost is $95 a week, or $47.50 per kit/$12 per serving. Green Chef allows you to switch between plans every week, but you cannot pick and choose meal kits between plans. There are often discounts for your first week. Use this referral link to get 2 meal kits/4 meals free your first week (a better deal than the one I got). I’m currently not a subscriber so I don’t get anything for referring you. 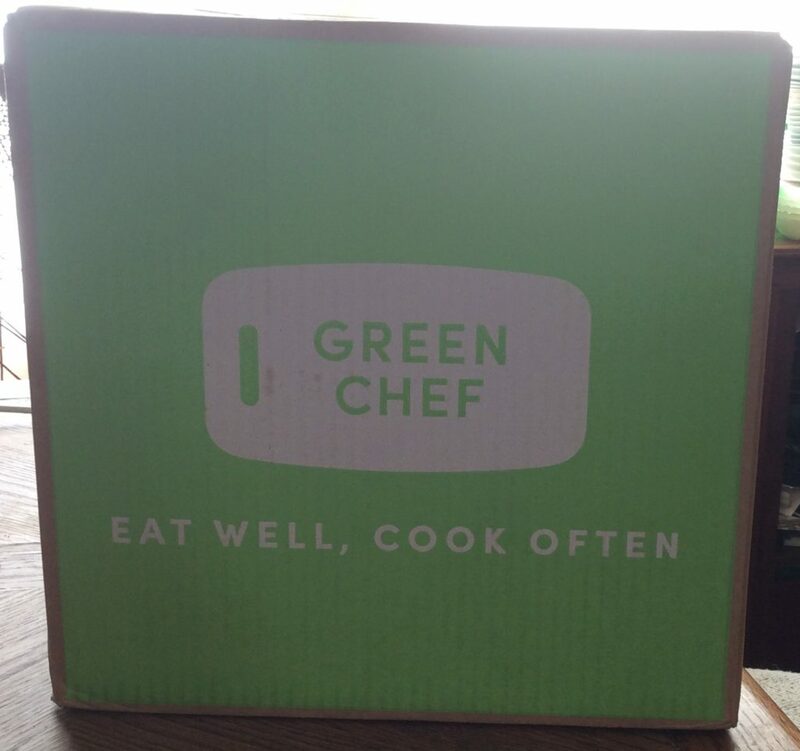 When I first subscribed, Green Chef allowed me to send a couple of free boxes to other people. As mentioned, Green Chef offers 7 different plans, each with 5 choices each. I haven’t looked carefully into each of the categories – but I did read a number of reviews that say the Keto plan does not actually include keto meals. The ones offered are too high in protein and carbs, and too low in fats. You can see the nutritional values of each meal on the Green Chef website before you order. Personally, I found the limited choices offered by Green Chef problematic. I had been wanting to subscribe to Green Chef for months, but couldn’t find a week where I was happy with three of the five choices in any menu. Of course, I’m a picky eater. Green Chef is owned by the same company that owns HelloFresh and their meals seem to be pretty similar. I would classify it as modern American cuisine. There are some international flavors, but generally those that have already broken through to the American mainstream. That said, I also read reviews of people complaining the flavors were too strong or exotic so if you’re a Sizzler and Mary Callender’s sort of diner, this may not be the right company for you. Green Chef is supposed to be a certified organic company, whatever that means. 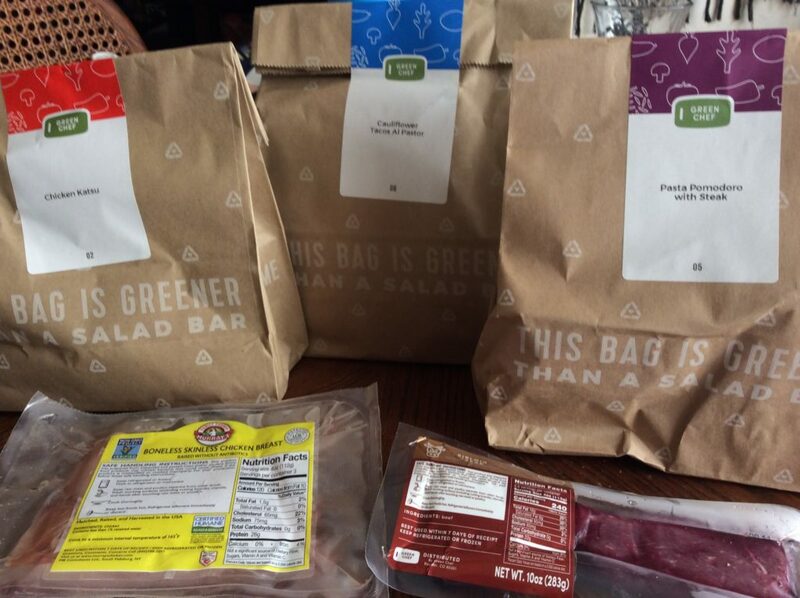 Most of the products Green Chef sent were organic, but interestingly, the meats were not. And while most of the ingredient seemed to be good quality, I can’t say the meats were any better than those that you get from HelloFresh or Every Plate, the company’s cheaper choices. 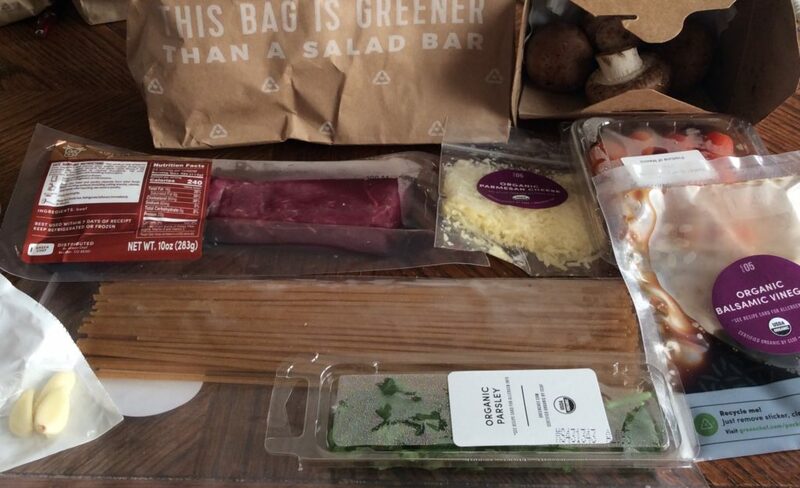 I understand that before HelloFresh bought it, Green Chef used to send organic meats, but that’s no longer the case. I was also sort of disappointed that none of the meal kits had really exotic ingredients – one of the reasons I like buying meal kits instead of just ordering the ingredients myself is so that I can use exotic ingredients without having to chase after them or buy enormous quantities that I’ll never use again. There were some cool black and white sesame seeds in one kit but everything else were supermarket-available ingredients. Finally, Green Chef sends you ingredients that are more processed than other kits, for example, the cabbage was already shredded and the pineapple was already cubed. However, they still require you to do further processing (chopping the above), which seems like a waste of time. If they are sending you cut ingredients, why not cut them to the size the cook will need? 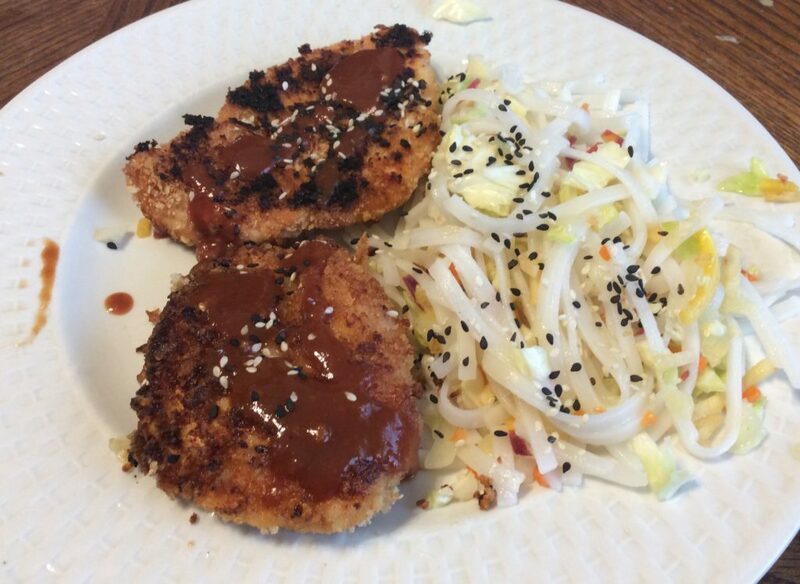 I was particularly irked that the chicken katsu recipe required me to cut the chicken breasts into two thin cutlets – why not sent cutlets to begin with? Processing chicken is the last thing I want to do in the kitchen. My box seemed to be in the road for several days. I got a notification that my box was on the way on a Friday, when it wasn’t scheduled to arrive until Monday. It did arrive fairly early in the day, and the food was still cold – though perhaps not as cold as that from other services. 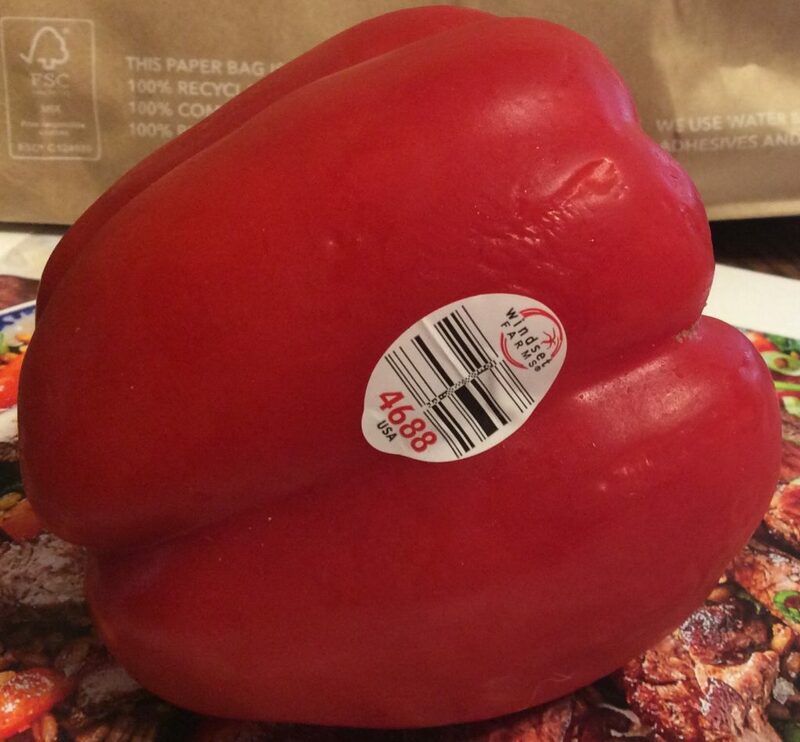 Despite its name, Green Chef is not particularly “green” as far as packaging goes. The kits came in an oversize cardboard box (which was OK, as my daughter re-used the cardboard to make dividers for her drawers). The paper lining was curb-side recyclable, which I appreciated, but it came within an unnecessary non-recyclable plastic bag. Within the box, the items for the meal kits come organized in color-coded paper bags. I like this system because I can put the bags inside the refrigerator (minus any ingredient that really shouldn’t be refrigerated) and take them out when it’s time to make the kit. I then used the bags to put the food trimmings for curbside compost pickup. As with other kits, the meats are placed between freezer packs at the bottom of the box. The freezer packs Green Chef uses must be thrown in the garbage, rather than composted our poured down the drain. This, to me, is a huge waste, as other companies manage to use more environmentally friendly alternatives. Like pretty much every other company, Green Chef uses a lot of plastic bags for its produce and ingredients. In all, I made three meal kits, including a vegetarian one. I was overall happy with the results, but not static. While the vegetarian dish became my daughter’s favorite meal kit so far, the other ones were pretty average as far as meal kits go, and nothing in them justified the premium price. All in all, Green Chef is not for me. The lack of choices and the less than amazing food simply does not justify the premium prices. It might for someone that is in a specific diet catered by Green Chef, but for the average person there are better and cheaper choices. This meal kit was a mixed bag. 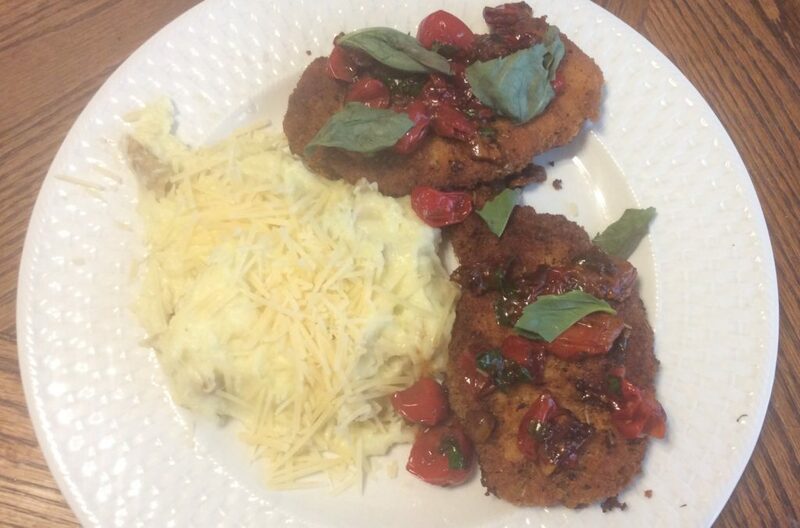 The pork milanese was sort of bland and it really needed acidity. The blistered tomatoes just didn’t provide enough of it. It was good with lemon juice, but not extraordinary. I did like the cheesy mashed potatoes a lot – but what’s not to like about cheesy mashed potatoes? I think my favorite thing about the kit was getting the eggs in their little container. Plus they were cool eggs. I only had to use one, and it had the darkest yolk I’ve ever seen. I made this kit for my husband and daughter, and they were both very pleased with it. A burger may seem like a trivial thing to make, but making a new and exciting burger and getting the right amount of fat in the meat – and the right quality meat – is not always easy. Given how expensive burgers have become, even at the regular price of $21 per kit this would have been a good meal, but I got the whole kit for $11 with a promo (make sure to always check on the right hand menu for referral links with promo), which was a super bargain. BTW, keeping the buns in the oven and then toasting them seems tow ork very well. 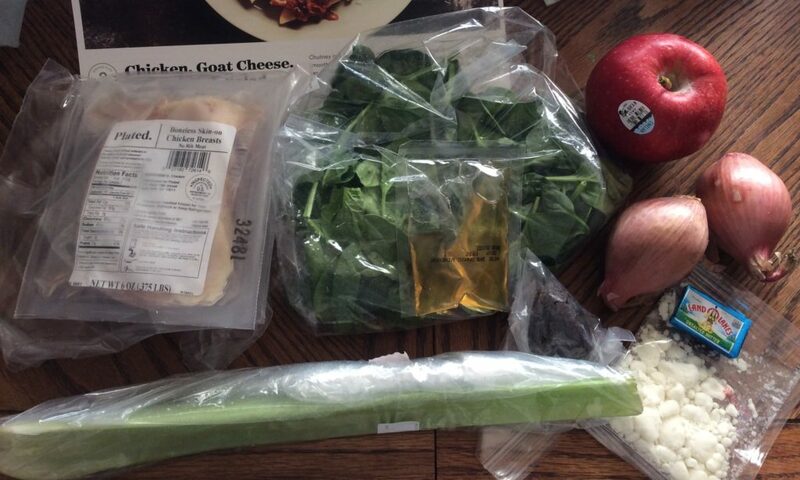 There was nothing complicated about this kit for Chicken, Goat Cheese & Spinach Salad with Shallot-Date Chutney, but I really enjoyed it – despite the fact that by the time I made it I was missing a couple of ingredients (my daughter ate the apple meant for the salad as a snack, for instance). The date-shallot chutney was a new flavor for me, and I appreciated it. I made the kit almost a week after I got the box, and the ingredients were still fresh. All in all, I was very pleased. My only complaint is that I think the portion was a bit small (or I was particularly hungry). I paid around $16 for the kit, or $8 a serving – using a “come back” promo I got in e-mail. It was a good price for the quality of the food. This kit for Pasta Pomodoro with Steak and balsamic cremini mushrooms made me, once again, question what the whole point about Green Chef is. 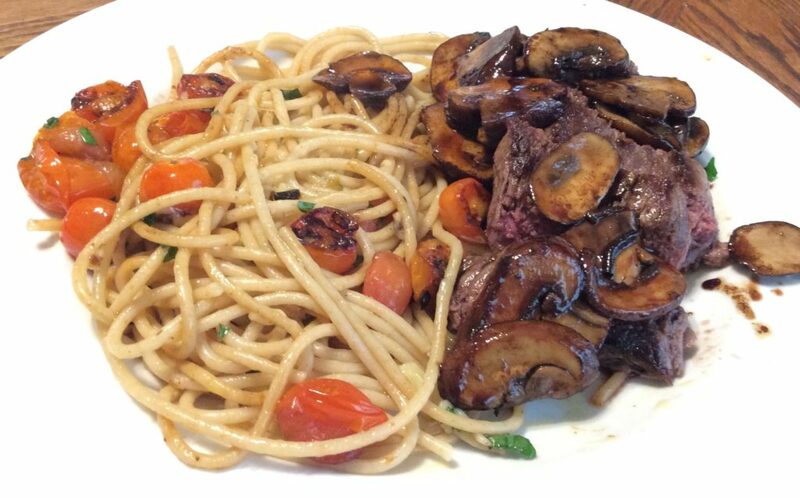 The beef was OK, the mushrooms were good but nothing extraordinary, and the pasta was bland. Most importantly, the meat wasn’t organic, it was plain sirloin (which must be the most boring cut out there), and there were not exotic ingredients – which makes me wonder why this kit is over $26. It convinced me, more than anything, that Green Chef is not for me. Still, my husband did love the mushrooms. But these were plain mushrooms cooked on the pan where the beef had been cooked for 5 minutes and then with balsamic vinegar for a couple of more minutes. Easy enough to do on our own. This kit for Cauliflower Tacos al Pastor, Slaw with cilantro-lime aïoli and refried black beans was a complete success for my vegan daughter. She actually wants me to make her more of these. The key to the dish is the sauce, of course, so I imagine I’ll have to experiment and find one that my daughter might like. Safeway has a pineapple peach salsa that might fit the bill. 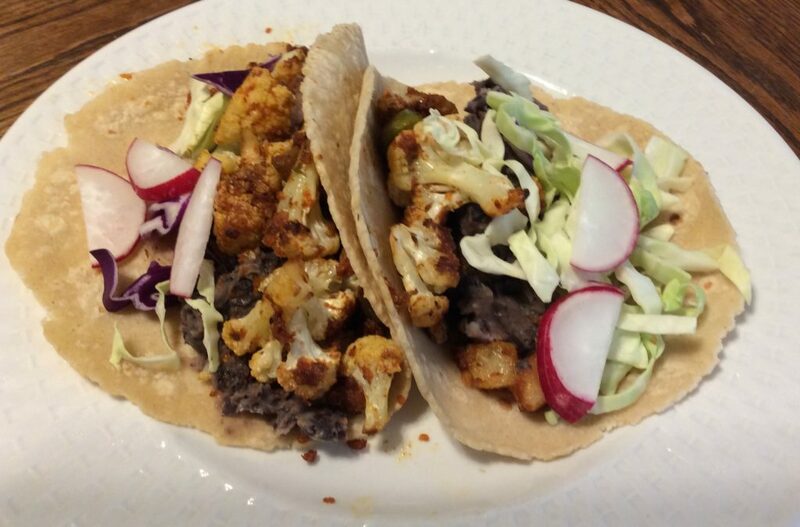 The cauliflower for these tacos is basically sauteed for 3-4 minutes with green pepper (which she didn’t like so I’ll omit next time), you then add some cubed pineapple, 1/4 cup of water and the al pastor sauce, and put it in a 400F oven for 15 minutes. This kit also taught me how to make mashed black beans – you put the canned beans in a pot with a little bit of water and a teaspoon of vegetable stock concentrate, cook it for five minutes and then mashed. The cabbage in the kit was supposed to be mixed with a cilantro aioli, but this wasn’t vegan, so I had to skip it. The cabbage was sort of blah on its own, but it added some crunch to the tacos. Again, all in all she liked them and she wants me to make them again. And I will, because I’m certainly not going to pay $26 to make this meal. I paid $10 with a promo, and for that it was a bargain.